This application is a continuation of U.S. application Ser. No. 12/416,592, filed on Apr. 1, 2009 now U.S. Pat. No. 8,044,588 which is a continuation of U.S. application Ser. No. 10/827,709, filed on Apr. 20, 2004 (now U.S. Pat. No. 7,514,868 issued Apr. 7, 2009) which is a divisional of U.S. application Ser. No. 09/953,765 filed on Sep. 17, 2001 (now U.S. Pat. No. 6,739,931 issued May 25, 2004). EL elements are ordinarily constructed in such a manner that an EL film is formed over anodes formed in correspondence with pixels, and a cathode is formed as a common electrode on the EL film In EL elements constructed in such a manner, however, a discontinuity can be easily caused in the EL film at a side surface of the anode, because the thin EL film having a thickness of 30 to 150 nm is formed over the anode having an increased thickness of about 200 nm, which is selected to set a low resistance. If a discontinuity is caused in the EL film, the anode and the cathode are short-circuited, light emission from the corresponding EL film portion is thereby made impossible, and a black-dot defect results. Also, discontinuity is liable to occur in the EL film and in the cathode in the vicinity 1005 of the line at which the side and upper surfaces of the insulating film 1001 meet each other. Ordinarily, the insulating film (bump) is in the from of a strip such as to cover the space between adjacent pixel portion. If on the bump formed so as to surround one pixel portion, a discontinuity is faulted in the cathode and extends continuously to form a closed curve, then the portion of the cathode within the closed curve serves no electrode function and no voltage is applied to the EL film. That is, a point defect results. For example, of the bump having a flat upper surface 107 as shown in the cross-sectional view of FIG. 20A, the opposite ends of a bottom portion of an insulating film 101 will be referred to as bottom end portions 104; the opposite ends of a top portion of the insulating film will be referred to as top end portions 106; and portions of the surfaces which contact the upper surface 107 of the insulating film and the upper surfaces of anodes 100 existing below the insulating film, which portions have an inter mediate height between the heights of the upper surface 107 and the anode surfaces, will be referred to as central portions 105. The surface of the insulating film is divided into the flat upper surface 107 and side surfaces 108. (3) According to the present invention, an EL element has an electrode, e.g., anode 100 on one side and insulating film 101 selectively formed on the anode 100. The bottom end portion 104 of the insulating film contacts the upper surface of the anode and contacts a curved side surface determined by a center of curvature (O1) and a first radius of curvature (R1) above a tangential line along which the anode and the bottom end portion contact each other. The top end portion 106 of the insulating film connects continuously to the upper surface of the insulating film and has a curved side surface determined by a center of curvature (O2) and a second radius of curvature (R2) below the boundary between the top end portion 106 and the flat upper surface 107 (see FIGS. 2A and 2B). The bottom end portion of the insulating film has a curved pro file such that the gradient of the EL film forming surface changes continuously. The coverage of the EL film formed on the bottom end portion of the insulating film is thereby improved to enable prevention of discontinuity in the EL film on the bottom end portion. The possibility of short-circuiting of the anode and the cathode due to discontinuity in the EL film is reduced thereby. Also, the EL film can be prevented from being locally reduced in thickness. As a result, localized convergence of an electric field in the EL film can be prevented. (4) The present invention is also characterized in that, in the arrangement described in (3) above, the first radius of curvature is within the range from 0.2 to 3.0 μm. If the first radius of curvature (R1) is smaller than 0.2 μm, the side surface of the insulating film 101 contacting the anode 100 rises so steeply as seen in the profile that a problem of difficulty in forming the EL film and the cathode uniformly in thickness on the side surface of the insulating film 101 arises. For example, the gradient of the EL film forming surface changes so abruptly that the thickness of the EL film on the portion of film forming surface corresponding to the abrupt change in the gradient is reduced to cause localized convergence of an electric field in the corresponding portion of the EL film. If the first radius of curvature (R1) exceeds 3.0 μm, the area of a thinner portion of the insulating film is so large that there is a tendency to increase the difficulty in suitably covering the TFT device with the insulating film. FIG. 1B shows the structure having improved reliability with which discontinuity in the cathode is prevented in comparison with the structure shown in FIG. 1A. Referring to FIG. 1B, insulating film 201 is selectively formed on electrodes, e.g., anodes 100, EL film 202 is formed on the insulating film 201, and cathode 203 is formed on the EL film. The structure shown in FIG. 1B is characterized in that the side surface of the insulating film including that of the top portion of the insulating film is curved. In a first etching step, reactive ion etching (RIE) is performed and the first reactive gas CF4, the second reactive gas O2 and the inert gas He are used as etching gases. At the start of etching, the gas flow rate of CF4, O2, and He is set to 1.5/98.5/40 (seem). With the lapse of etching time, the flow rate of the first reactive gas CF4 to second reactive gas O2 is increased so that the gas flow rate of CF4, O2, and He is finally set to 7/93/40 (seem). The flow rate of the first reactive gas CF4 is relatively increased to increase the sloped surface taper angle of the insulating film. The sloped surface taper angle of the insulating film is continuously changed by fine steps to form the side surface of the insulating film so that the side surface has a curved profile. The radius of curvature of this curved surface will be referred to as “first radius of curvature”. Preferably, the first radius of curvature is within the range from 0.2 to 3.0 μm. Thus, a first region 318 in the side surface of the insulating film is formed (FIG. 4B). Thereafter, etching is performed without removing the resist film. In a second etching step, CF4, O2, and He are also used as etching gases and etching is continued while constantly maintaining the gas flow rate of first reactive gas CF4, the second reactive gas O2 and the inert gas He at 7/93/40 (sccm). A region where the sloped surface taper angle is constant is thereby formed in the side surface of the insulating film 303. That is, a second region 319 is formed in the side surface of the insulating film. The taper angle of the sloped surface of the insulating film formed in the second etching step is determined by the gas flow rate ratio finally set in the first etching step. If the proportion of the first reactive gas CF4 relative to the second reactive gas O2 is higher, the sloped surface taper angle of the insulating film becomes larger. Preferably, the taper angle of the side surface of the insulating film in the second region 319 is within the range from 35° to 70°. In a fifth step, the resist film and the organic film on the substrate are immersed in a basic developer, thereby performing development. As this developer, a tetramethylammonium hydroxide (TMAH) developer having a concentration of 2.0 to 6.0% may be used. Of the resist film, the portion exposed to radiation of ultraviolet rays is first dissolved in the developer. Thereafter, organic resin film 311 having polyamic acid has a main component is isotropically etched by the basic developer with the resist film as a mask. Most of the polyimide resin film 311 under the resist film 310 remains by being protected by the resist film. However, portions of the polyimide resin film below edge portions of the resist film are etched by the isotropic etching to have curved side surfaces (FIG. 6B). In a eighth step, EL film 423 is formed on the polyimide resin film, and cathode 424 is formed on the EL film (FIG. 6D). Next, the resist film undergoes exposure and development. Resist film 327 is formed by being superposed on end portions of adjacent pixel electrodes and the gap between the pixel electrodes. Then the insulating film is isotropically etched. A well-known method may be used to perform isotropic etching. For example, it is known that in a case where etching is performed by generating plasma, etching progresses isotropically if the etching atmosphere pressure is increased (Practical Dry Etching Technique, REALIZE INC. p. 40). The insulating film is removed under edge portions of the resist film by etching, so that insulating film 328 having curved side surfaces remains (FIG. 19B). The fabrication method will be described with respect to a case where a photosensitive organic material is used. It is possible to smoothly form the sectional profile by performing exposure of a photosensitive material and etching using a developer. A photosensitive polyimide resin film or a photosensitive acrylic resin film may be used as an organic material. Preferably, the photosensitive organic material used is of a positive type. The etching methods mentioned above can be used generally for forming contact hole in an insulating film of an EL display device or other electronic devices such as LCDs. The drive circuit portion 450 has different circuit configurations with respect to a gate signal drive circuit and a data signal drive circuit. The difference therebetween will not be explained in this specification. Wiring conductors 412 and 413 are respectively connected to n-channel TFT 452 and p-channel 453. A shift register, a latch circuit, a buffer circuit, etc., are formed by using these types of TFTs. In the pixel portion 451, a data wiring conductor 414 is connected to the source side of switching TFT 454, and a wiring conductor 415 on the drain side is connected to gate electrode 411 of current control TFT 455. The source side of current control TFT 455 is connected to a power supply wiring conductor 417, and an electrode 416 on the drain side is connected to the cathode of the EL element. FIG. 9A is a top view of the thus-constructed pixel portion. In FIG. 9A the same reference numerals as those in FIG. 8 are used to indicate the corresponding portions. FIG. 8 is a cross-sectional view taken along line A-A′ in FIG. 9A. As a high-molecular material for EL film, π-conjugated polymer material, etc., are known. Typical examples of such materials are crystalline semiconductor film paraphenylene vinylene (PPV), polyvinyl carbazole (PVK), and polyfluorene. The EL film formed by using such a material is used in a single layer or laminated structure. The light emitting efficiency is improved if the EL film is used in a laminated structure. Ordinarily, a hole injection layer, a hole transport layer, a light emitting layer, and an electron transport layer are formed on the anode in this order. However, a structure formed of a hole transport layer, a light emitting layer, an electron transport layer laminated in this order, or a structure formed of a hole injection layer, a hole transport layer, a light emitting layer, an electron transport layer, and an electron injection layer may alternatively be used. According to the present invention, any of well-known EL film structures may be used and the EL film may be doped with a fluorescent pigment or the like. Examples of organic EL materials usable in this embodiment are those disclosed in the specifications of the following U.S. Patents or Japanese Patent Laid-open Publications: U.S. Pat. Nos. 4,356,429; 4,539,507; 4,720,432; 4,769,292; 4,885,211; 4,950,950; 5,059,861; 5,047,687; 5,073,446; 5,059,862; 5,061,617; 5,151,629; 5,294,869; and 5,294,870, and Japanese Patent Application Laid-open Nos. Hei 10-189525, Hei 8-242048, and Hei 8-78159. Generally, there are four multicolor display methods: a method in which three kinds of EL elements corresponding to red (R), green (G), and blue (B) are formed; a method in which white light emitting EL elements and a color filter are combined; a method in which blue- or blue-green light emitting EL elements and fluorescent materials (layers of fluorescent color converting materials:CCM) are combined; and a method in which a transparent electrode is used as a cathode (counter electrode) and EL elements corresponding to RGB are superposed. A device 457 is a current control TFT in the adjacent pixel potion. The source side of current control TFT 457 is connected to power supply line 417. Because common power supply line 417 can be used for each adjacent pair of pixel portion, the open area ratio can be increased. FIG. 13 shows an example of a display device using inverse staggered TFTs. A substrate 501 and EL elements 556 used in this embodiment are the same as those of Embodiment 1, and the description for them will not be repeated. An example of an electronic device using the display device described above as Embodiment 1 will be described with reference to FIG. 14. In the display device shown in FIG. 14, TFTs formed on a substrate constitute a pixel portion 921 having pixel portion 920, a data signal drive circuit 915 used to drive the pixel portion, and a gate signal drive circuit 914. The data signal drive circuit 915 is shown as an example of a digital drive and is constituted by a shift register 915, latch circuits 917 and 918, and a buffer circuit 919. The gate signal drive circuit 914 has a shift register, a buffer, etc., (each not shown). Typical examples of triplet compounds are organic compounds described in the following papers: (1) T. Tsutsui, C. Adachi, S. Saito, Photochemical Processes in Organized Molecular Systems, ed. K. Honda, (Elsevier Sci. Pub., Tokyo, 1991) p. 437, (2) M. A. Baldo, D. F. O′Brien, Y. You, A. Shoustikov, S. Sibley, M. E. Thompson, S. R. Forrest, Nature 395 (1998) p. 151, in which organic chemical compounds expressed by formulae shown below are disclosed, (3) M. A. Baldo, S. Lamansky, P. E. Burrows, M. E. Thompson, S. R. Forrest, Appl. Phys. Lett., 75 (1999) p. 4, and (4) T. Tsutsui, M.-J. Yang, M. Yahiro, K. Nakamura, T. Watanabe, T. Tsuji, Y. Fukuda, T. Wakimoto, S. Mayaguchi, Jpn. Appl. Phys., 38 (12B) (1999) L1502. In the operation of the cellular phones shown in FIGS. 15A and 15B, luminance is lowered when the operation keys are used, and the luminance is raised after usage of the operation switch, whereby the low power consumption can be realized. Further, the luminance of the display device is raised at the receipt of a call, and the luminance is lowered during a call, whereby the low power consumption can be realized. Besides, in the case where the cellular phone is continuously used, the cellular phone is provided with a function of turning off a display by time control without resetting, whereby the low power consumption can be realized. Note that the above operations may be conducted by manual control. a conductive layer over the light-emitting layer. 2. The light-emitting device according to claim 1, wherein the light-emitting device is a display device. 3. The light-emitting device according to claim 2, wherein the display device is a passive matrix display device. 4. The light-emitting device according to claim 1, wherein the transparent conductive layer comprises indium-tin oxide. 5. The light-emitting device according to claim 1, wherein the metal layer is a source electrode or a drain electrode of a transistor. Amendment C (after final), re U.S. Appl. No. 11/293,986, dated Oct. 15, 2007 (with pending claims at that time; now US 7,459,849). Baldo, M.A. et al, "Highly Efficient Phosphorescent Emission from Organic Electroluminescent Devices," Nature, vol. 395, Sep. 10, 1998, pp. 151-154. Baldo, M.A. et al, "Very High-Efficiency Green Organic Light-Emitting Devices Based on Electrophosphorescence," Applied Physics Letters, vol. 75, No. 1, Jul. 5, 1999, pp. 4-6. Notice of Allowance re U.S. Appl. No. 11/293,986, dated Aug. 1, 2008. Office Action re U.S. Appl. No. 11/293,986, dated Jan. 2, 2008. Office Action re U.S. Appl. No. 11/293,986, dated Nov. 21, 2006. Tsutsui, T. et al, "High Quantum Efficiency in Organic Light-Emitting Devices with Iridium-Complex as a Triplet Emissive Center," Japanese Journal of Applied Physics, vol. 38, part 2, No. 12B, Dec. 15, 1999, pp. L 1502-L 1504. 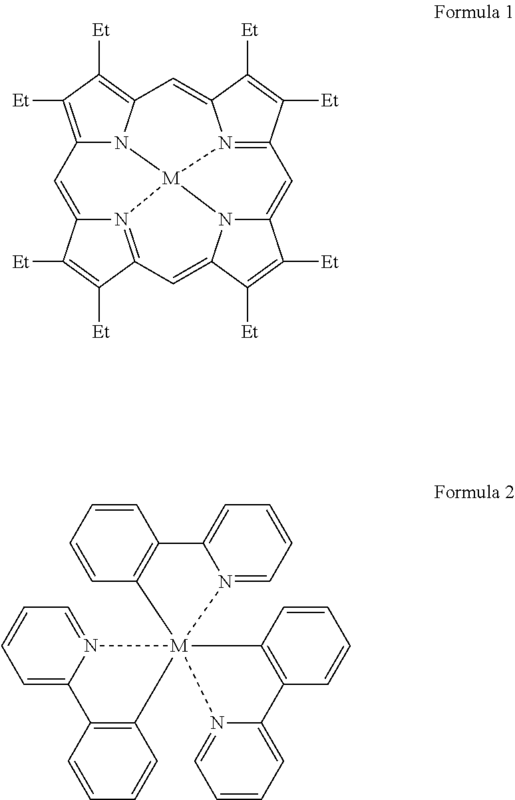 Tsutsui, T., et al, "Electroluminescence in Organic Thin Films," Photochemical Processes in Organized Molecular Systems, 1991, pp. 437-450.